July 18, 2013 /0 Comments/in Toenail Fungus Treatments /by Jenn F.
For many patients suffering from toenail fungus, the first course of treatment is to take a prescription of terbinafine under the brand name Lamisil. However, as with all oral medications, side effects can and do occur. Did you know that change in taste or loss of taste is one of the potential risks associated with popularly prescribed oral toenail fungus treatments? How Often Does Lamisil Taste Loss Occur? 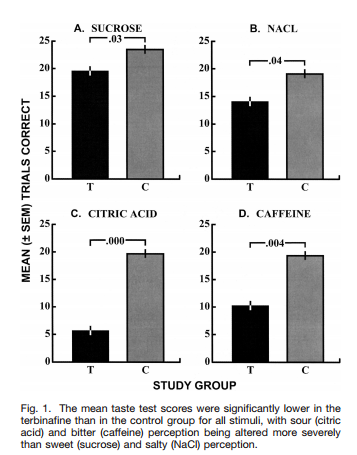 Who Suffers Terbinafine Taste Loss? A more recent aggregate of data looking at FDA reports found that, of the 6,600 people who took Lamisil, 149 people (2.25%) reported taste loss. 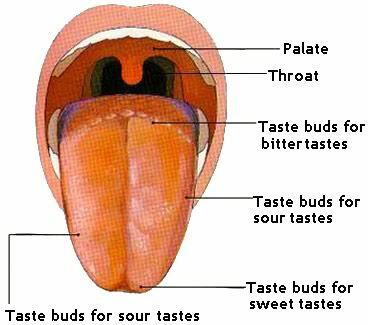 The population of people reporting loss of taste were an almost 50/50 male/female split. While gender was balanced, it seemed the risk increased with age. The odds of developing taste loss are 12.8 times higher for patients over 55 as they are for patients under 35. Furthermore, the risk is 4.4 times higher for people with a body mass index of 21 or less. What Are People Saying About Lamisil Side Effects? In another documented case, a 51-year-old woman told her doctor that eating, drinking and tooth brushing triggered a bitter aftertaste and increased salivation. The first few mouthfuls of every food tasted normal, but was quickly followed by a bitter taste. Her ability to taste anything sweet had completely gone. She had only taken terbinafine for two months, but she was still suffering from symptoms 18 months later. Three years later, the woman had partially recovered her ability to taste sugar, but the persistent bitterness had still not abated. While these cases are rare, they are still possible, which is something to consider when taking Lamisil for onychomycosis toenail fungus. The only proposed treatment for taste loss — whether due to medication use or chemotherapy — is zinc supplementation. One study looked at 50 people suffering from dysgeusia and found that 140 mg of zinc gluconate a day for three months resulted in taste improvement for 50% of the group. They also found that depression levels improved significantly. If you currently have toenail fungus but are worried about this taste loss side effect, skip Lamisil and seek onychomycosis laser treatment instead — which has no known side effects. To prevent a recurrence of fungus nails, treat your shoes with the SteriShoe UV shoe sanitizer nightly to kill off up to 99.9% of the harmful microbes living in your footwear.